stratton had the most liked content! "Norbold it pains me to say it but on people's opinions who i respect, and looking at stats i am resigned to the fact that OVE had the edge over Briggo.Really have studied there records closely,so annoying i have not got a terrific amount of 50s stats but it has been enjoyable none the less both two great Legends though. I will never forget the Oxford round how driven he was to compete, he really wanted to be Champion badly the weird thing is if he had ever reached his goal i think he would of been a good WC. There were a few Halifax fans who never liked him never took to him certain things happened and were covered up he made some silly race moves.For me like you said he was a very fast rider at his best,and after 82 he took his eye off the ball had business dealings going on and injuries took its toll.He was a very good rider good anough to win a WC but it never happened i really enjoyed watching him though his BLRC wins were terrific. As usual "Norb i got it wrong again!! with Arthur (age) not to worry eh! When only five years old my mate Gary Belcher can always remember him sliding around his slabs outside his kitchen on a chopper bike.With a Swindon race jacket on with No 1 on it with the name Barry Briggs on it i will never forget that, wish i had that race jacket now Happy Christmas Norbold to you and your family. How Do We Attract A New Young Audience? Be interesting to know who these people WERE that he alienated? Berry was a strong individual and it is just what the sport needs now.Also not alot is spoken about how GOOD he was at man management, Mike Lee said he was superb helped him alot when he was younger.Ok he was not everyone's cup of tea,but certain people in speedway at the time were scared stiff that Berry would change things for the better for the WHOLE of the sport it never happened a big miss for me. Spot on 'screamer" mostly all the folk i know that are speedway supporters have gone since they have been young uns.These supporters very rarely just start going in there twenties,for me all those suggestions you made are terrific also some families like Football can't always afford to go to both in a week certainly if they have two kids.To make it a bit cheaper would help,maybe dont even charge for kids,these kids are the ones speedway need to be coming back in the next twenty years plus,a really hard question this how to sell speedway. Not at his age now Boocock, and would he of wanted to do it in the past more and likely a big NO but he would have been as good as anyone i have known in the last twenty years or so easily.Steachmann no disrespect what has he done talks well looks modern but he would not be tough anough for tough decisions Boocock certainly would of been certainly in his Pom. Ian Thomas is a fine example as why speedway has never moved on, Thomas was a fine promoter and businessman why would he let go to his piece of the pie.How many other Ian Thomas's have we had in speedway quite a few over the years that is why speedway has never progressed or moved on.Forget John then Eric Boocock would of done for me seen everything what do you think Humph.? But Humph you tend to forget Berry was TOUGH,had his brush with certain people but moved on.If he was put in the position which alot of us wanted to be paid but to be IMPARTIAL he would of done it.In speedway in within people i know you are the only person i know who has objected to him ok he was prickly at times but boy he knew what he was doing. Swindon 2016 - A New Era Starts...we Thought..
Give him the benefit of the doubt "hagon cracked me up listening to your response happy Christmas mate. Totally right could do with John now, being realistic as Fraser said (we are are doomed) i think the product generally the racing is good but the sport is going nowhere harsh but true. Totally agree that Mike Patrick picture i have love the picture in red leathers presume most of us have or have seen it what a style.Looking back Tommy could of faced PC,Lee,Olsen Ivan at his peak how us the public missed out he would of won titles i am sure of it. 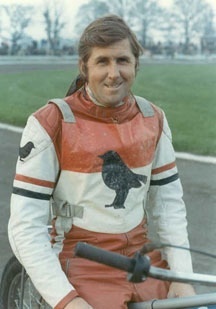 Great style Jack had what a rider for me, Vic Duggan even ousted him style wise and later on Leigh Adams, ok Leigh did not win a WC what a style he had.I was lucky to see him everyweek a real treat he was like SIMMO they looked like they were racing in a armchair never in trouble in total control. People within the sport looking after there own interests? nothing has really changed Steve since JB i was not always a fan of John but he grew on me and could of changed the direction of British Speedway. You were unlucky Norbold bigtime my uncle raved on about Crutcher never took any notice at all researched his record decades later well.Forrest he retired really young didnt he was he 27/ 29.? a real racer gutsy.